In the not too distant future, the United States of America has been ravaged by nuclear war. A vast megalopolis known as Mega-City One now encompasses the entire east coast. Due to its immense size and population density, the massive city-stat is a veritable cesspool of crime. Instead of sitting on bench with a gavel, Judges are given heavy artillery and charged with policing city streets. The most notorious of these is Judge Joseph Dredd (Karl Urban), as relentless a lawman as has ever existed. 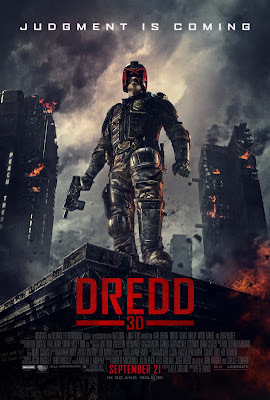 One day, Dredd is partnered with a young rookie named Cassandra Anderson (Olivia Thirlby). The two respond to a call in Peach Trees, a giant slum contained in a single 200 story high-rise. In the upper reaches of the building, a vicious gang lord named Ma-Ma Lena Headley) commands an ever expanding drug ring that distributes a narcotic known as “Slo-Mo.” She locks down Peach Trees and places a bounty on the heads of the judges. Suddenly, both Dredd and Anderson are in the fight of their lives. Dredd is an adaptation of the 2000 AD comic strip Judge Dredd. It is the second such attempt to bring that property to the screen, the first being the execrable Stallone vehicle Judge Dredd. Thankfully, Dredd has no connection whatsoever to that debacle other than the source material itself. It takes a different approach to the material, offering something grittier and more stripped-down. It manages to be better and more entertaining than expected, though nonetheless routine. If the 1995 version of Judge Dredd had two saving graces: The production and costume design. Mega-City One looked like Mega-City One, and the judges looked like judges. Dredd is no slouch in this department either, though the budgetary constraints are visible. The scope is much smaller, as the bulk of the action is confined to a single location. Mega-City One looks similar like any other modern city aside from the expected architectural exaggerations. Skyscrapers stand unrealistically tall. The aesthetic is also a bit grungier. Much of the activity inside Peach Trees takes place underneath minimal lighting, but it is still discernible. In terms of plot and setting, Dredd bares some striking similarities to The Raid: Redemption. However, quite unlike The Raid, Dredd does not seek to raise the bar for action choreography. Good guys and bad guys alike wield some really cool hardware, but the execution is fairly standard. The slow motion photography echoes the “Bullet-time” technique popularized by The Matrix, though a bit more stylized. There’s not a stitch of martial arts-style fisticuffs to be found. What the film lacks in fancy pugilism, it makes up for in brutality. As gruesome as some of the bloodletting is, it never quiet reaches the “survival horror” grandeur of The Raid, but it still works. The original Robocop took more than a bit of inspiration from the Judge Dredd comic strip, particularly it’s ultra-violent and satirical tone. Dredd is more than a bit reminiscent of Robocop. It’s surprising, then, that the satirical elements of both properties somehow got lost in the mix. There are the requisite jokes and puns peppered throughout the dialogue, but that’s about it. There’s nothing in the way of actual commentary, despite there being ample opportunities around every corner. That missing element could have added a few much needed layers to this film. From a story perspective, Dredd often feels very episodic. It plays like the pilot for a futuristic cop show. This is in keeping with the adventure serial format of the weekly strip, but it also makes the film feel a bit trite. Karl Urban is a good a Judge Dredd as one can hope for. He’s one note and strictly business. His mouth and chin remain in a furrowed sneer throughout the entire film, and his eyes remain hidden by the helmet. Just as in the strip, the audience never really gets to “know” him. He represents the ideals of the system he serves, nothing more. Olivia Thirlby does a lot with the bare bones of a character she’s given. Her compassion contrasts well with Dredd’s merciless nature, yet she never seems less than capable in a firefight. The character of Ma-Ma is perhaps the only real let down. Her ruthlessness is treated casually. She’s merely a figurehead. Dredd is very much like its main character: stoic, unflinching, and all about the job at hand. Its focus is narrow, and it’s single-minded in its purpose. Had it aimed just a bit higher, such qualities would play more as strengths than limitations. Missed opportunities aside, the film mostly fulfills its agenda, which is more than can be said for many of the blockbusters released so far this year.